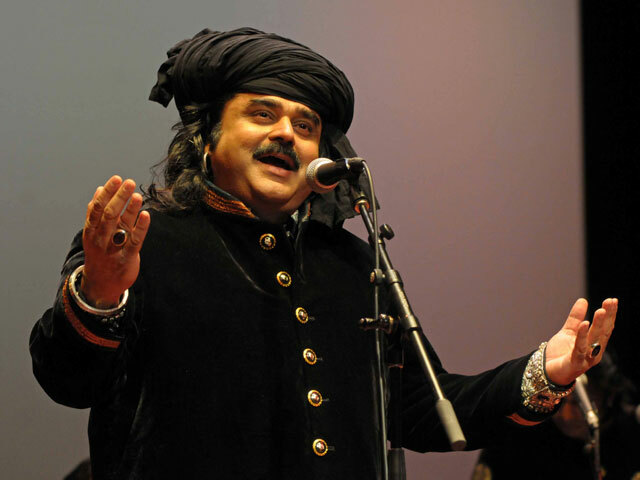 Arif Lohar was born in Lala Musa in Gujrat District, Punjab, Pakistan. His father was Alam Lohar, who belonged to the village of Achhin nearby Kharian Tehsil, and was a prominent folk singer of Punjab and Pakistan. Arif Lohar started singing with his father and eldest brother, Arshad Mahmood Lohar, and younger brother Tariq Lohar at an early age. Arif Lohar briefly moved to acting in Punjabi movies before returning to his music career at the age of 22. Arif Lohar has played more than 50 foreign tours around the world during the last 20 years, including to the UK, US and UAE. In 2004, he performed in China for the opening of the Asian Games, which had a crowd of close to 1 million. He once performed in North Korea for the late President Kim Jong-il as part of an international delegation of peace and goodwill. He has also played multiple lead roles in Punjabi movies, and sang and produced three songs for the soundtrack of Syed Noor’s film Jugni (film), the highest-grossing Pakistani film of 2012. In 2005, Arif Lohar was awarded the Pride of Performance Award by the Government of Pakistan – the highest civil award in Pakistan. To date, he has more than 150 albums to his cr . and recorded more than 3,000 songs, mostly in the Punjabi language. In 2006, he made headlines in the Punjabi music world by releasing his album 21st Century Jugni, with music produced, arranged, and mastered by Mukhtar Sahota in Wolverhampton, UK, which was released by Internalmusic UK. In June 2010, Arif Lohar participated in Coke-Studio (a Pakistani live session programme by Rohail Hayat). During Coke-Studio season 3, Arif Lohar performed “Alif Allah (Jugni)” with upcoming musician Meesha Shafi. Lohar’s performance for Coke Studio featured two other songs: ‘Mirza’ and Alif Allah Chambey Dey Booti/Jugni, the latter a collaboration that became an international success. Filmmaker Saif Ali Khan bought the rights to “Jugni” for use as a feature song in his Bollywood movie Cocktail. Other versions of “Jugni” have also been featured in Bollywood movies, including an adapted version that first appeared on 21st Century Jugni in Diary of a Butterfly. In 2004, Arif’s eldest brother, Dr Arshad Mahmood, formed Alam Lohar Memorial Trust (ALMT) in honor of their father. An affiliate of the trust was a production studio called ALMTV Studios. The studio was designed to raise awareness for health campaigns in the UK, including the Stop Smoking, and Healthy Mothers and Healthy Babies campaigns on behalf of the NHS. These campaigns targeted mainly Pakistani and other South Asian communities with health problems, and Arif performed concerts around the UK to promote them. In September 2010, Arif Lohar began actively campaigning to help victims of the 2010 Pakistan floods. He appeared on national television to help encourage local and international fundraising, and also performed at special concerts throughout Pakistan.